"Palm Beach Atlantic University is devoted to "advancing lifelong, Christ-centered scholarship, service, and citizenship in an educational community" in the arts, humanities, and sciences. To get an overview of the surrounding area, you can take an aerial tour." What is a typical Palm Beach Atlantic University student like? Describe the type of person that should attend Palm Beach Atlantic University. What are the top 3 reasons someone should attend Palm Beach Atlantic University? What was a typical Palm Beach Atlantic University student like in high school? Describe the type of person that should attend Palm Beach Atlantic University. Students at Palm Beach Atlantic University are all highly motivated. The students have a great interest in their community. They are dedicated and have a thirst for learning. They also love warm fantastic weather. Palm Beach Atlantic University was founded in 1968 as a coeducational Christian liberal arts university. The University waClasses at Palm Beach Atlantic University, formally Palm Beach Atlantic College, were conducted in dowtown West Palm Beach. Currently, PBA's main campus is located on Flagler Drive with stunning views of the Intracoastal, and steps away from Palm Beach. s named for its location in the Palm Beaches and its proximity to the Atlantic Ocean. The first classes were held in the fall of 1968. PBA held its first graduation in the spring of 1972 and later that year received initial accreditation from the regional accrediting association. 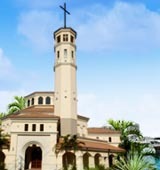 Classes were first held at 1101 South Olive Avenue in downtown West Palm Beach in the former facilities of the First Baptist Church. nt roles for the University. Today, the building is undergoing renovation to serve as a portion of the Warren Library. The University has a comprehensive campus master plan that incorporates approximately 27 acres of land from the Intracoastal Waterway west along Okeechobee Boulevard to Dixie Highway, south to Jefferson Street, and back east to the waterway. The first building completed was the Lassiter Student Center, which was occupied in 1983. In addition, the University has purchased nearly 100 acres just minutes from campus for the construction of an outdoor athletic complex. What are the top 3 things that students do for fun at Palm Beach Atlantic University? Campus housing is available for undergraduates. Housing deposit : $300.00. Housing deposit due : Aug 20. Housing deposit is refundable in full if student does not enroll.. Freshman allowed to have car. No pets. The average student pays $22,793 for tuition, fees, and other expenses, after grants and scholarships. Total stated tuition is $25,232, in-state and on-campus, before financial aid. Learn more about financial aid at http://www.pba.edu/admissions/financial-aid/index.cfm. Estimate the net price for you at http://www.pba.edu/admissions. Palm Beach Atlantic University participates in the NCAA Division II for college athletics.